I know from conversations with friends that I’m not alone in being surprised at how much I enjoyed the whole TdF thing. It really did bring the community together, more than anyone expected, I think. More than any other event I can think of. Some further thoughts on that towards the end of this page. First some appreciation of the way the buildings of Bootham were beautified by so many householders and businesses. This page is an accompaniment to the photos included earlier. From handmade bunting to businesses making the most of the advertising opportunity, early July saw a wide range of decorations, individual, often handmade, some witty and some beautiful. Many aesthetically pleasing combinations of bunting in different colours, different flags, against stone and red brick, on black railings. Things then seemed fairly quiet and uneventful until a few days before, when I noticed a definite embrace of all things ‘Le Tour’ on more and more of the buildings I passed on my way home from town. As my earlier attempts by St Mary’s Tower had proved, it’s quite difficult to take decent photos and enough of them when you’re struggling back from town with a load of bags of shopping. Proper walking and looking and photo-taking has to be an unencumbered thing. So I went back later a couple of times to record how my local patch was welcoming and celebrating the imminent arrival of Le Tour. On the evening of 5 July, the night before the riders would be passing down Bootham, I happened to catch perfect evening light, at the perfect time. At this time of year it’s full and rich and lasts so long into the evening and I know that it falls beautifully onto the Georgian elegance of Bootham. Anyway, where were we … ah yes, on Bootham. Of course. I realise that Bootham gets a lot of attention on these pages, but that’s because it’s the road I know best. But seeing it all decorated was like seeing it afresh. What was most interesting, and it seems to have been the same across Yorkshire, was how the opportunity to decorate on the ‘Tour de France’ theme was so widely interpreted. 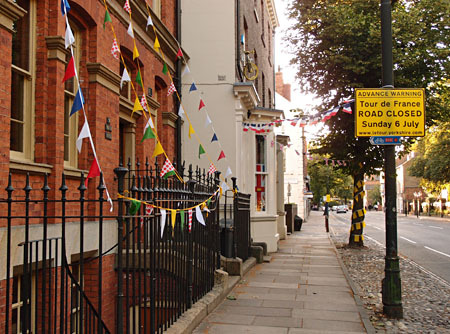 In this one street of Bootham, I noticed different choices of bunting. Redmayne Bentley stockbrokers favoured the union jack. 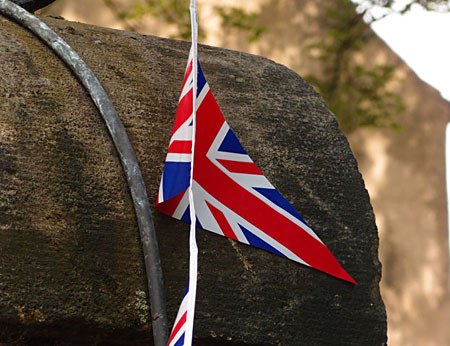 I’ve never seen it as a particularly beautiful thing, but noticed that the combination of union jack bunting on the dark stone gateposts of the Churchill Hotel was one of the handsomest things in the street, and took many photos, attempting to do it justice. 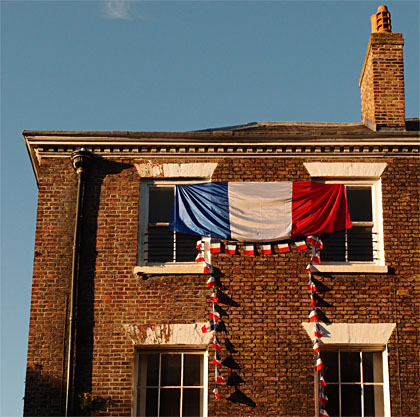 It had never really registered that 61 Bootham is the home of the Alliance Française in York until I saw their fabulous flag and bunting and decoration draped across the front of it, and bunting hung from the side window too. All lit by that warm evening light on 5 July. 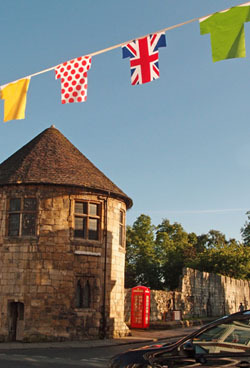 The national flags were in general overshadowed by the more widely used TdF bunting, and a general theme of yellow. Impressive bunting stretched across the railings at the front of Wandesford House was clearly handmade, from yellow gingham. This building is one of the oldest in Bootham (many earlier buildings were destroyed in the siege) and was built as a home for older single women. Impressively, centuries on, it still is. (But some things change — language does, thankfully — this building used to be called ‘the old maids’ hospital’. The ‘old maids’ have a good sense of humour. 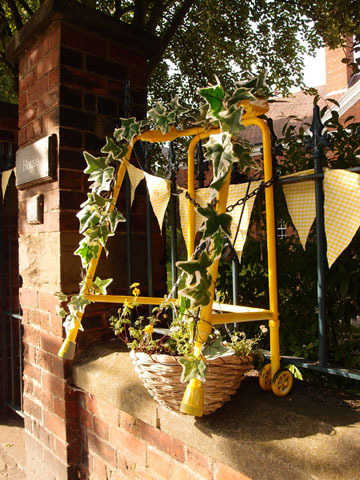 On the day itself I noticed a new TdF decoration on the railings: a walking frame painted yellow and decorated, with attached hanging basket. A witty variation on the ubiquitous yellow bikes and a clever reminder, as the fit young men sped by, that we have many different ways to get about, and that the majority of us will never reach their impressive levels of mobility. There were a few spray-painted yellow bikes on Bootham, and of course everywhere else. But the handsomest bikes were in the window displays of several shops, particularly Priestley’s at No. 36 and the Garden of Eden florist next door. (See the photo gallery.) Bikes surrounded by flags and flowers. Flowers also featured further down the street in touches of yellow in hanging baskets and window boxes. 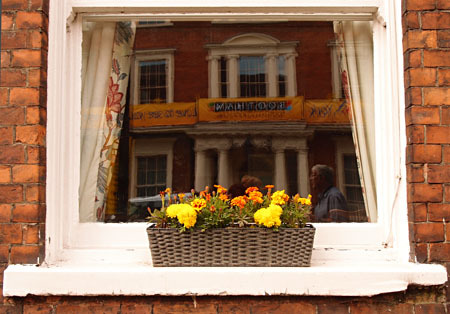 On the evening before the event I noticed, in one of the private houses on Bootham a huge bouquet of yellow blooms carefully arranged in the bay window. Several businesses made the most of the advertising opportunity, most noticeably Smiths Gore, with massive banners in triplicate including their website address very clearly. 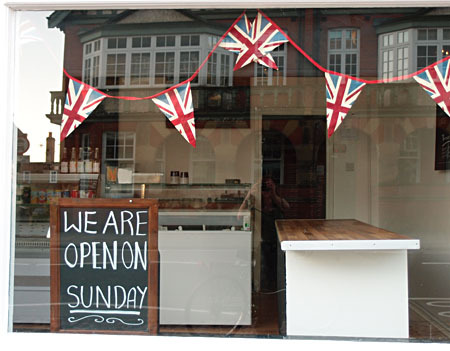 All the cafes and food shops not normally open on Sundays had large signs in the window saying that they would be, which was no doubt welcomed by the hundreds of people lining the street all the way from Bootham Bar to Clifton Green. Fabulous aromas rose from the open door of Dough, a new occupant of 73 Bootham, displaying classy union jack bunting made of fabric rather than plastic. That shops and hotels made an effort to decorate their premises is perhaps not surprising, but it was surprising how enthusiastically many of them did it, how lavishly, and also how many people, residents who had nothing particular to gain, had entered into the spirit of it, enthusiastically decorating their frontages. I’ve never seen anything like it. 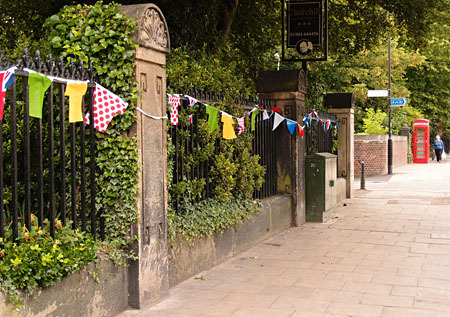 When I cycled through one of York’s suburban areas a few weeks back, near the start of the World Cup, I saw some enthusiastic World Cup themed house decorations, huge England flags hanging out of windows. But you’re only going to do that if you’re a massive fan of football. The ‘yellow fever’ seems to have had a much wider reach, taking in people who have no particular interest in the TdF, or sport in general. And that’s what friends have said, that they were surprised by how enthusiastic they felt by the time the event actually arrived. People who said that they might stand up and look out of the window for the couple of seconds when it passed were actually to be found on the day hanging out of the window an hour before waiting for it to arrive. The atmosphere on Bootham was buzzing, and from the photos I’ve seen it looks similar everywhere those riders went through. So why did this bring so many people together, even people who don’t generally feel drawn in to a sense of ‘national celebration’ about other events? We didn’t have to all get behind a national flag, for a start, which helps. 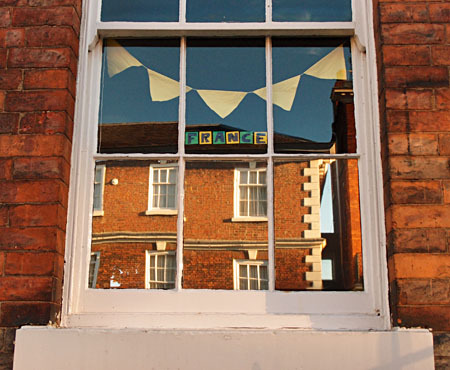 So though you may have demonstrated your allegiances with your choice of bunting, you could also display plain yellow bunting or balloons or flowers or paint a bike yellow. So it was something everyone could gather round? Is it perhaps because the focus was on York/Yorkshire, does that make it easier to gather everyone in? Yorkshire is well-known for its strong sense of regional identity. It seemed to take in everyone, seemed properly inclusive. Certainly I loved the creative responses I’ve seen in recent weeks. I’d love to know your thoughts on the event and the build-up to it if you were here in York. If you watched us on the TV or online, how did we look? This page was sponsored by a reader of this site. Thank you. I liked your pictures and words on the Tour and can relate very well to your feelings about it. Which, like you, I’ve heard echoed by others. I think you make a very important point about the particular character of the Tour as compared with, say, football: non-partisan, non-tribal, non-aggressive, non-deferential. My own experience of the Tour in York was that people who normally have zero interest in big sporting events felt able to take it to their hearts, make it their own, and enjoy it in an uncomplicated way. Certainly the people I encountered on Sunday morning were relaxed, happy, full of what used to be called good fellowship. I think the way it was organised too, by both the Yorkshire tourist bodies and the Tour itself, was inclusive and generous in spirit, and people responded to that. Very different to the control-freakery of the Olympics, when you couldn’t use the word “olympics” without the Branding Police threatening you with legal action. People also responded to the local character of it all, the fact this was a Yorkshire event, and it’s very hard to make Yorkshire a thing of brands, image and money – it can’t be contained by those things, is too much a matter of people’s hearts, of deep feelings and associations. So I like to think anyway. We did welcome Le Tour, and we can be proud of our welcome. And we enjoyed it. Your words and images capture that superbly.